The decision wasmade by the Board of Directors of the Biennale di Venezia chaired by PaoloBaratta, on the recommendation of Venice Film Festival’s director MarcoMueller. The new versionof Bellocchio’s Nel nome del padre(In the Name of the Father,1971) will be screened at the 68th Venice Film Festival, following theawards ceremony for the Golden Lion, in the Sala Grande at the Palazzo delCinema. This version is not a restoration, but an entirely new, “current” work,culled by the director from the original film’s material. It is a singulardirector’s cut that, rather than lasting several minutes more, is actuallyshorter than the original: 90’ for this “redux” version of Nel nome del padre, as against the105’ for the film released in 1971. Marco Bellocchio himself noted: “This was notan idée fixe (nothing obsessive about it), yet over these (forty) years Irecurrently had the idea and came to the conviction that Nel nome del padre had not yet found its definitive form. Bearingevidence to this is the fact that, since its first public screening at the NewYork Film Festival in 1971, Nel nome delpadre was re-edited four times, including this last revision. I felt anecessity that in the past I didn’t feel (for fear of being politicallyambiguous, or perhaps for lack of an overall vision?) to free the images, toliberate them from their crushing, suffocating ideological weight… At the timethat the film was made, to imagine freely was inconceivable. That’s why so manyimages full of words that judged, quoted, explained, and then reiterated theexplanation, were dropped. In this later version, I curbed the expressions ofmuch of the culture of those years for the benefit of the story, of thecharacters, and of the simpler and more direct personal relationships. I cutand shortened without adding a thing. Established asone of the leading figures of Italian cinema by his very first film, I pugni in tasca (Fists in the Pocket, 1965), MarcoBellocchio had to work very hard to “break free” of this onerous and unexpectedsuccess. He did so by delving into visionary excitement in Nel nome del padre (1971), narrativeclassicism in Marcia trionfale(Victory March, 1976), andpsychological drama in Il gabbiano (1977).In Salto nel vuoto (A Leap in the Dark, 1980) he strucka remarkable balance between his penchant for great prose and his tensiontowards poetic cinema. This allowed him, starting with the incandescent Diavolo in corpo (Devil in the Flesh, 1986), todevelop his research into a kind of cinema that captured the unconsciousimpulses, leading to the formalism of Lacondanna (The Conviction,1991) and the experimentalism of Ilsogno della farfalla (1994). By probing the darkness of the unconsciousin Il principe di Homburg (The Prince of Homburg, 1977), Bellocchiosought to objectify the themes that have troubled and inspired him for so manyyears, which he later addressed in the past tense in La balia (The Nanny,1999) and in the present tense in Buongiorno,notte (Good Morning, Night,2003) and L’ora di religione (My Mother’s Smile, 2002). In recent yearshe has created training and filmmaking opportunities for young students,notably at the “Fare Cinema” workshop he organizes every year in Bobbio, out ofwhich came Sorelle mai, presented out of competition at the 2010 Venice Film Festival. The worldwide success of Vincere (2009) confirms Marco Bellocchio’s standing, alongside Bernardo Bertolucci (honorary Golden Lion in 1975) and Ermanno Olmi (honorary Golden Lion in 2008), as one of the three major Italian screen directors still active today. According to many international observers, Bellocchio’s work embodies all that is most courageous and innovative in Italian cinema. 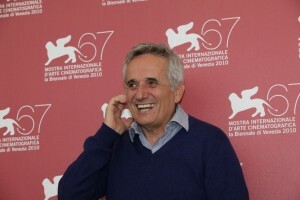 Marco Bellocchio first participated at the Venice International Film Festival with his second film La Cina è vicina (China is Near, 1967), winning the Special Jury Prize. He ran with Matti da slegare (Fit to be Untied) in the “Proposte di Nuovi Film” section in 1975, with the medium-length film Vacanze in Valtrebbia (Vacation in Val Tribbia) in the “Officina Veneziana” category in 1980, and with Gli occhi, la bocca (The Eyes, the Mouth) in Competition in 1982. He participated twice in the 1990s with the short film Il sogno della farfalla (1992) and the medium-length film La religione e la storia (1998). In 1997 Bellocchio served as president of the “Corto Cortissimo” section jury, and in 1999 was a member of the Competition jury chaired by Emir Kusturica. Over the past decade, his medium-length film dedicated to Verdi entitled Addio del passato (2002) competed in the New Territories category, Buongiorno, notte (Good Morning, Night, 2003) won a special prize in Competition, and his Sorelle Mai (2010) was screened out of competition.